Like any other object, skip bins have limitations in terms of their use. There are certain considerations that you need to think about to keep your skip bins in tip-top shape all the time. There are also policies that come with skip bin use. What are the limitations of skip bins? As functional and hardy as they may be, you can’t throw anything at them and not expect anything bad to happen. Imagine a mini skip bin being carelessly doused with toxic chemicals and rolled around – it’s not going to be pretty. If you are thinking of getting a skip bin hire in Newcastle, consider the following limitations. Got a clean-up or renovation project going on? You will probably notice that you lack the resources to get rid of all the waste. A mini skip bin hire is the perfect solution for smaller items. But if you’re getting an entire section of your house demolished for renovation, then get a larger skip bin. The more the potential waste, the larger the skip should be. It’s pretty simple. Note that some of these items are either damaging to property (the skips themselves included!) or can injure people if improperly handled. Always keep safety first! Not a limitation specific to skips but rather a limitation to consider for all waste disposal. Will the weight of the skip and the rubbish inside be easily transported? Who will do the transporting? And how? If there is a large amount of rubbish and the skip bin is quite heavy, a lorry for transport is the obvious choice. But if you live near a body of water, then you can consider transporting by barge. There are Newcastle skip hires available that load into barges. Not everyone has an industrial skin bin lying around – they’re pretty expensive. The smarter choice would be to rent skip bins. Like all other objects for hire, skip bins also have a time limit when rented. Consider the amount of time that you will need – from sorting and recycling to loading the skip bin, estimate the total amount of time it will take. To save money, make sure that you call the skip pickup service on time! Going past the due date may incur penalties. The Newcastle Council requires any skip placed on public land to be properly accounted for, and that is why these permits are needed. No exceptions. Even if you think you’re only going to have the bin for a couple of days and no one will notice, the skip hire company will insist. If you do not have the private space where you can put the skip bin, you may be able to place them on public or council property. Your preferred skip bin company can do that for you to save you the trouble. You wouldn’t want your skip bin to be filthy, would you? Keep your skip bin clean to avoid damage. Always use the right cleaning agents – soap, scrubs, and deodorisers. If you don’t have the time to do it, or the dirt becomes too hard to clean, consider hiring a professional cleaner. Have you identified your skip bins limits? If not, allow us to help you out! If so, then give us a call! 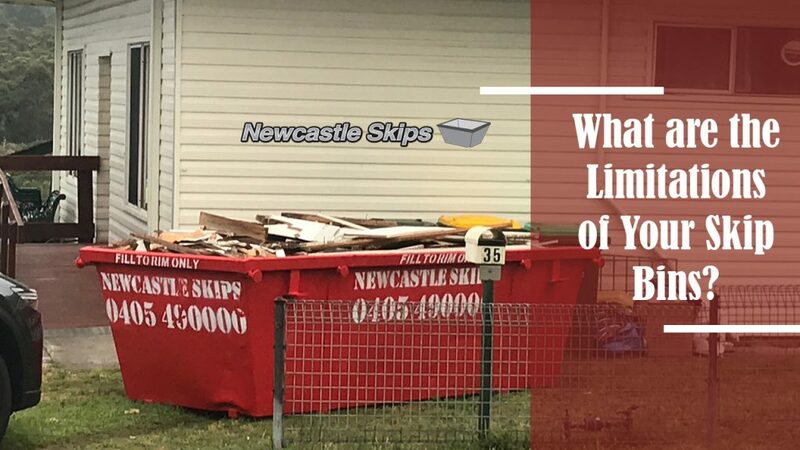 Here at Newcastle Skips, we are more than willing to provide our excellent services and skip bins for your rubbish removal and waste management needs. If you have a project in mind, contact us for a consult!